For many, this is simply godsend! The Dry Shampoo is a blessing for those who are forced to go days without washing their hair, or are simply too lazy to do so. Along with conditioner, this has to be the greatest invention for our hair, for it lets us forgo regular shampoo, but keep hair fresh. Regular shampoo removes oils from our scalp, which keeps our hair dry and non-sticky, but as soon as we skip a shampoo session the oils build up until the scalp feels something akin to a grease machine. This eventually reaches the end of the hairs, making it sticky and unpresentable at the least. Dry shampoo prevents this oil build up and keeps the hair and scalp dry, resembling fully washed hair. And unlike other styling products like pomades and gels, dry shampoo does not weigh your hair down. However, there are some basic rules you need to follow if you want to get the best out of the bottle. When spraying it onto your hair, keep it about five to six inches away from the scalp. Keeping it any closer will result in excess buildup, which will be hard to mix in through hair strands. The instant after spraying, most dry shampoos will leave a white residue; you have to give it a while to disappear completely before you start styling. If your dry shampoo produces residue that does not go away, brush it thoroughly to get rid of the cast. 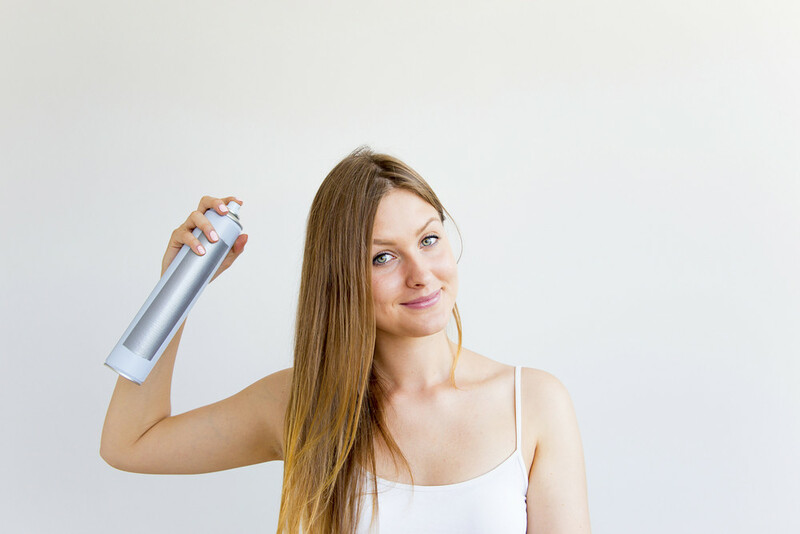 Take sections of your hair and spray it little at a time to prevent buildup. Add as you go to have just the right amount and it will give you a more natural finish than adding a ton at once. To get a real natural finish and prevent white residue, separate the front section of your hair and hold it up, spray behind it at the roots. This way you get volume, the oils disappear, and no white cast! Surprisingly this lifesaver of a product has other interesting uses as well, besides saving you from a bad hair day. If you have naturally curly hair, or want to hold your curls in place, dry shampoo can be a good solution instead of harsh gels or hairsprays. Simply spray on the dry shampoo to your strands, and brush through with a hair brush for even distribution and scrunch your curls with your hands. This will give a natural finish to your curls without looking too made up. Having bobby pins fall off our hairstyles is a common problem. Fix it by spraying dry shampoo onto a bunch of bobby pins, and then clip them on. It will give them a better grip and will not slip down. One can also add volume to the hair by using dry shampoo. Spray it on and then massage the scalp to get some air in. The powder from the shampoo in addition to the air will help add volume to the hair close to your scalp. This is a better alternative than hairspray or texturizing sprays which tend to be stickier, and is definitely a better option than the ruthless backcombing which practically kills your strands. Dry shampoos come in powder forms and as well as sprays. Although the canned version is more popular for ease of use, powder form is not much different either. In terms of results, they both give pretty much the same finish and texture, so either will work. When it comes to brands, we do not have a lot of variations here, but the options available are great at their jobs. Brands like TRESemmé, Batiste and L'Oréal Paris have a good range of dry shampoos that are locally available, and loved globally. So if you are looking to get yourself a bottle, these brands should be on your list. Overall for a quick fix and bad hair days, or days you simply cannot get yourself up for a full wash, a bottle of dry shampoo can be your good companion.